Offering you a complete choice of products which include paraquat dichloride 24% sl, pendimethalin 30% ec and ammonium glyphosate. 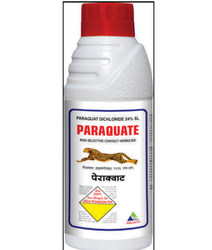 We are involved in offering Paraquate Herbicide(Paraquat Dichloride 24% SL) to the customers. Our offered product is a non-selective contact herbicide and absorbed by the foliage with some translocation in the xylem. Quality approved ingredients are used during the composing of this product. In addition to this, we are offering it in accordance with the requirements of the customers. 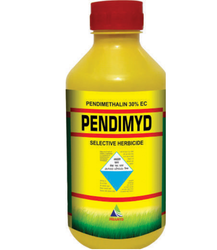 Our respected clients can avail from us a quality proven range of Pendimyd Herbicide(Pendimethalin 30% EC), which is processed under the hygienic conditions. This is highly used in handling per-emergence control of annual grass as well as broad-leaved weeds. Apart from this, our clients can avail these products from us at budget-friendly prices within the promised period of time. 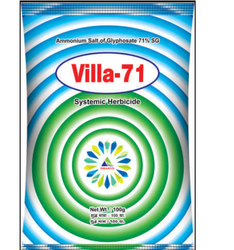 With our in-depth knowledge of this domain, we are actively engaged in manufacturing a supreme quality range of Villa-71 Herbicide(Ammonium Salt of Glyphosate 71% SG). May be applied for general weeds control in non-cropped industrial, recreational and public area.